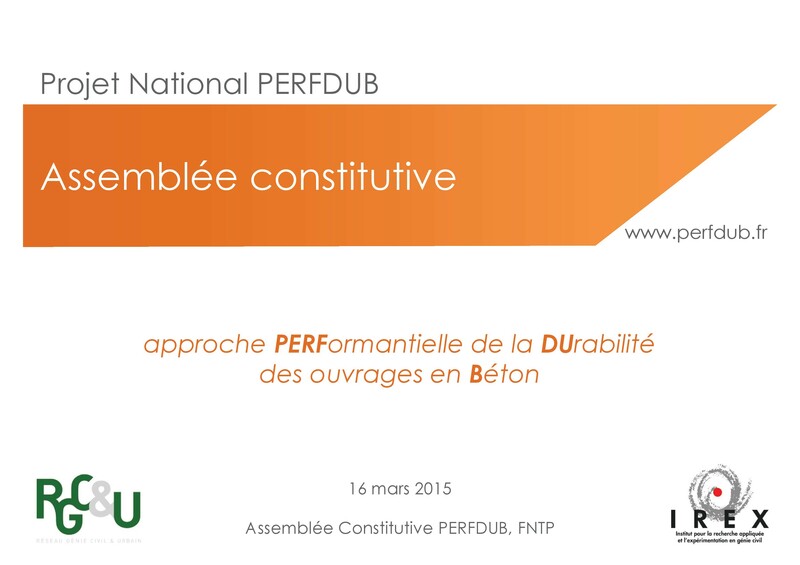 The main objective of the National Project PERFDUB is to define a methodology for justifying durability of concrete (and concrete structures) with a performance-based approach, including the “absolute” method and the “comparative” method. It aims to aggregate the knowledge and feedback, to fill gaps, in a framework involving all stakeholders so that the performance-based approach becomes operational and everyday, which does is still the case today. For twenty years, significant international researches proposed predictive models associated with primary mechanisms conditioning the durability of concrete structures. Despite the progress made, these models are still not integrated into a standardized approach. Yet it is possible to develop a rational quantitative approach to potential service life of structures (in project or just built) in connection with the physical properties of concrete measurable by the tests on which the performance-based approach relies. This methodology is intended for works for which a specific level of quality assurance is provided. The field of research concerns the new structures but is also interested in old structures in order to link pathologies where ageing is observed to the type of concrete and its sustainability features. The project covers very broad issues that have been the subject of many research activities over the last twenty years. Its aim is to strengthen and supplement the existing data, thus improving the employment recommendations of performanced-based approches (“absolute” and comparative) so as to promote their applicability and their integration into a normative framework. PERFDUB is a collaborative research project certified by the RGC&U (civil engineering network) provided on 4 years from March 2015. The overall budget is of the order of 3.8 M € of which is funded through the National PERFDUB Project (administered by IREX) and the other in the MODEVIE project (Modelling of ageing concrete structures) supported by the ANR. A “National Project” (PN) is a specific procedure of collaborative R & D in the field of construction i. Research programs launched under the labellized “National Projects” gather (on the basis of a voluntary commitment) all the stakeholders involved in the construction sector: contractors, engineering companies, industries producing raw materials or building components, public and private laboratories, universities and engineering schools.